And so, having taken in the dovecote at Harlestone and its adjacent laundry, to nearby Great Brington, to look at the church and have lunch with a friend. In the church I was prepared to be amazed at the panoply of Spencer monuments, which famously fill a memorial chapel adjoining the chancel. * Sadly, the chapel is fenced off with locked railings. There were notices hanging on these railings, which I expected to contain helpful captions identifying the figures on the tombs, but they turned out to bear warnings that the chapel was alarmed and requests that visitors should not poke their hands or noses through the bars. So one had simply to peer. What one can make out in the gloom is truly spectacular., A series of large monuments, several with life-size effigies, dating from the 16th to the 19th centuries and including works by Nicholas Stone, Nollekens, and Flaxman. The Elizabethan and Jacobean ones are painted in the dazzling array of colours and patterns that people then loved. They are set about with obelisks, columns, pediments, and an array of other architectural devices. The painting and carving was restored, beautifully, by the 7th Earl Spencer in 1946. I offer a couple of pictures of this rich but inaccessible treasure. 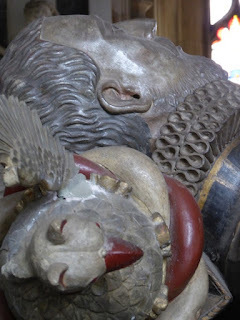 The first is a close-up of one of the heads that can be seen through the railings: that of Robert, 1st Baron Spencer, made in 1599 by Jasper Hollemans of Burton-upon-Trent.† The head of the deceased rests on his helm, which has a bird crest visible in the left foreground of my picture. The hair and ruff are cut with the crisp deep detail usual on the best monuments of the time; the face has a chiselled character that must be attributable to the subject as much as to the sculptor. As a contrast, here’s some of the decoration around the tomb of Sir John Spencer (died1586) by the same artist. Here we see the top of an obelisk covered with strap work and finished off with a golden ball finial. There are also architraves, mouldings, and friezes decorated with a range of pattern, stipple, and mottled paintwork, plus a modicum of gilding. 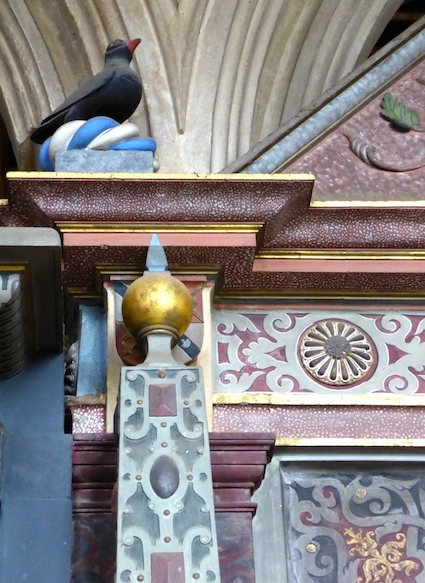 At the top is another bird crest which is just one tiny heraldic detail (there are many coats of arms in the pediment, not visible in my image). I can understand the family not wanting crowds getting too near all this precious statuary and paintwork, whatever other reasons there may be for fitting alarms in the Spencer Chapel. I remain grateful for the glimpses I could take, and also hopeful against hope that one day they’ll let the rest of us marvel at their artistic and funerary heritage. *Spencer being the family of Diana, Princess of Wales, although the church is famous as the place in which Princess Diana is not buried. Her grave is on an island in the grounds of the nearby family house, Althorp. †Hollemans was a Dutchman who came to England in the 1580s; Burton-upon-Trent was a centre of alabaster carving. The Hollemans family were Protestant refugees, as were some of the other craftsmen who worked at such major English houses as Burghley around this time. The refugees (Dutch, Flemish, French, and so on) joined other groups from Europe who had recently settled here and who might be called ‘economic migrants’ today: the French ironworkers who settled in the Weald, the German miners of Keswick, and the master glaziers who worked in places such as York. Britain’s commerce, art, and industry gained greatly from such arrivals from the mainland. I think I would have shared this dovecote with you whatever its context. 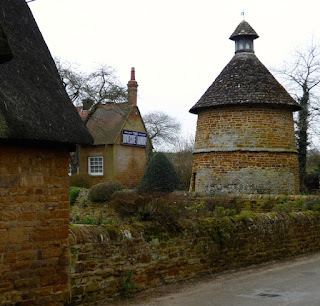 I was immediately taken with its circular form, conical roof, and canted walls, a shape that seems to give it extra stability, as does the string course for that matter, while setting off its lovely toffee-coloured ironstone walls to great effect. It’s in what I take to be an outlying hamlet of the Northamptonshire village of Harlestone, a place not so much nucleated as a series of straggling lanes and junctions that is very much in the orbit of the Spencer estate of Althorp, whose park wall I drove past just before stopping by this arresting little building. 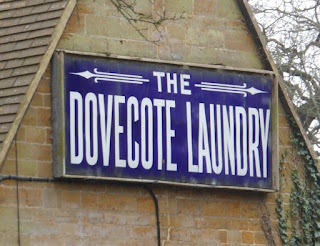 However, the context makes it more memorable still: a small group of cottages and associated buildings, plus a larger house (Park Farm House, ironstone again, with quoins), and above all the former premises of the Dovecote Laundry – no longer plying the dolly or posser, but still sporting its sign. It was the sign, course, that made me still more excited: regular readers will know my love of old signs and interesting lettering. 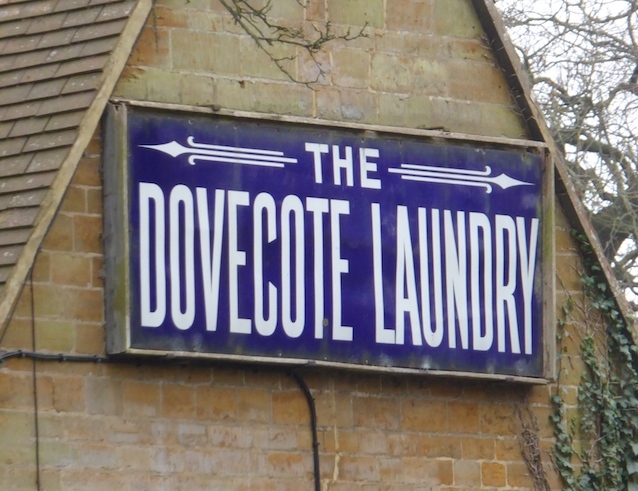 Well, if you going to start a laundry here, next to the dovecote, you probably would call it the Dovecote Laundry, and you probably would give it a big blue sign with tall, eye-catching letters like these. I’ve written several times before about the medieval liking for pigeon-meat and its general restriction to the upper and land-holding classes, noting, with my love of odd-shaped buildings, at least one round dovecote, one octagonal one, and another built into a church. I don’t know whether this 15th-century example sent its young pigeons to the table of the Spencers’ great house nearby or whether they were the preserve of the farmer, but no doubt many thousands found their way to appreciative consumer’s plates across the years. Coo! My British readers, and many of my other readers too, probably have a fairly clear idea of the Cotswolds. 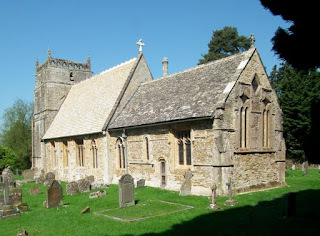 A largely rural region of rolling hills, green fields, and limestone villages with the occasional small country town; an area in which much of the architecture, from roofs to flag floors, from fireplaces to garden walls, is in Cotswold stone. We expect to see cottages, churches, and barns, but not industrial buildings, the woollen mills of the Stroud valleys being the major exception. Here in rural Oxfordshire, the pattern is generally true to form – but as in many quiet Cotswold corners there has been industry. The area is full of fast-flowing streams and mills of various kinds, first water powered, later driven by steam or other engines, have been part of the local scene for centuries. So if this mill by a river a short distance away from the main Cheltenham to Oxford road is a surprise, it should’t be. For most of its history it was not a corn mill like so many country mills. It was first a mill for fulling cloth and then a paper mill. * Paper was produced in Widford from the late-18th century and through the 19th. Various generations of the Hart, Holliday, Ward, and Milbourn families ran the business and these buildings date to some time in the 19th century. The mill buildings are a mix of Cotswold stone walls with industrial style metal windows. The roof is not of local stone but slate. Purists complain about slate roofs in the Cotswolds. But slate is light, strong, durable, and practical and although local limestone roofing ‘slates’ look best in the context of a village full of limestone houses and walls, grey Welsh slate doesn’t offend me here. Welsh slate has been brought to the area for years, so its use in combination with limestone walls has a long history. Widford feels like a backwater. It’s a tiny hamlet with just a handful of scattered houses and farms and a tiny church in a field. But the mill wasn’t a backwater in industrial terms. By 1852, the History, Gazetteer and Directory of Oxfordshire reported that it was ‘fitted out with some splendid machinery…worked by steam power’. Samuel Milbourn, who was then the miller, was also associated with patents and innovations in paper-making. The mill at Widford, then, is a small surprise that overturns some of our expectations about the Cotswolds, but, architecturally at least, does so in a way that is hardly noticeable to the casual passer-by. Such passers-by may not even notice this modest building. I’m glad I did. *A believe that when paper milling ceased here, the building had a period as a corn mill, then had some other industrial use before being converted to housing. Starting to think again about the lost country house of Coleshill reminded me about one thing especially that struck me about the place. As Karen Fielder says in her essay, although the house itself has gone, the estate still exists.† As well as the gate piers in my previous post, the many interesting architectural remains include a model farm, a dovecote, a walled kitchen garden, and a number of cottages. Of course thousands of English cottages once formed part of country estates. They were built to house workers on the farms and those who maintained the house, and serviced the estate in all kinds of ways. While household servants would live in, in the attic rooms of the big house itself, workers in other areas – from the fields to the carpenter’s shop – would have had cottages. Such estate houses often follow the prevailing architectural style of the area, but sometimes they have distinctive features that mark them out as special, something that shows that they belong to the estate – a special design of porch, say, fancy bargeboards, or a particular paint shade. Glazing bars with fancy patterns are sometimes such a defining feature, and this seems to be the case at Coleshill. Perhaps it’s because cottage builders liked such glazing patterns in the late-18th and early-19th centuries – this was when many estates were ‘improved’ by their landlords, who built better housing for their workers and adopted modern farming techniques too. Coleshill has several houses with these lovely windows glazed in hexagonal and diamond-shaped panes (along with others that have plainer square panes). The way the masonry is set off with details in ashlar (smoothy worked blocks of stone) at the corners and around the windows is another sign that some care and expense was taken with the houses in the picture. Without such details, buildings like these would look like fairly standard Cotswold houses (Coleshill is near the edge of the Cotswolds, where the hills yield to the flat country around the Thames) but the details set them apart. 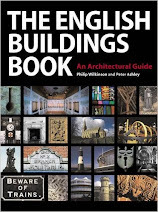 *I use the ‘historic’ English counties because of a sentimental attachment to them and because they are used by the Pevsner Buildings of England series. ¶A friend reminds me that Coleshill was also the home of the great record producer George Martin, who died recently. RIP. I’ve visited the village of Coleshill several times and on one occasion I’ve posted briefly about the Coleshill estate, the site of a great 17th-century house that was burned down in 1952, the remains being demolished soon afterwards. 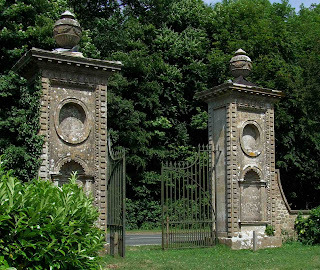 In my earlier post I highlighted the elaborate pair of gate piers pictured above, and I pointed out that I found their position slightly odd and that their ‘best’ side could only be seen from inside the gate – evidence, I thought, that they were designed to be seen by the occupants of the house rather than by passers-by. Something I read yesterday sent me back to my old post. I have been reading parts of a fascinating new book, a series of essays edited by Jon Stobart and Andrew Hann called The Country House: Material Culture and Consumption. I’m sure I will read the rest of this book and write about it in my next group of reviews in the spring, but meanwhile I cannot resist mentioning what I read in the book’s final essay, on the estate at Coleshill.† The author of the essay, Karen Fielder, has lots of good things to say about the significance of this estate with its vanished house, but what she said about the gate piers especially caught my eye. The piers, she reveals, have been moved. They were originally in the formal gardens of the house, when no doubt the niches (and the busts they once contained¶) were set off to best advantage. But in the late-18th century the 2nd Earl of Radnor re-landscaped the garden and re-sited the piers by the road through the village so that they framed a view of the house from that road. 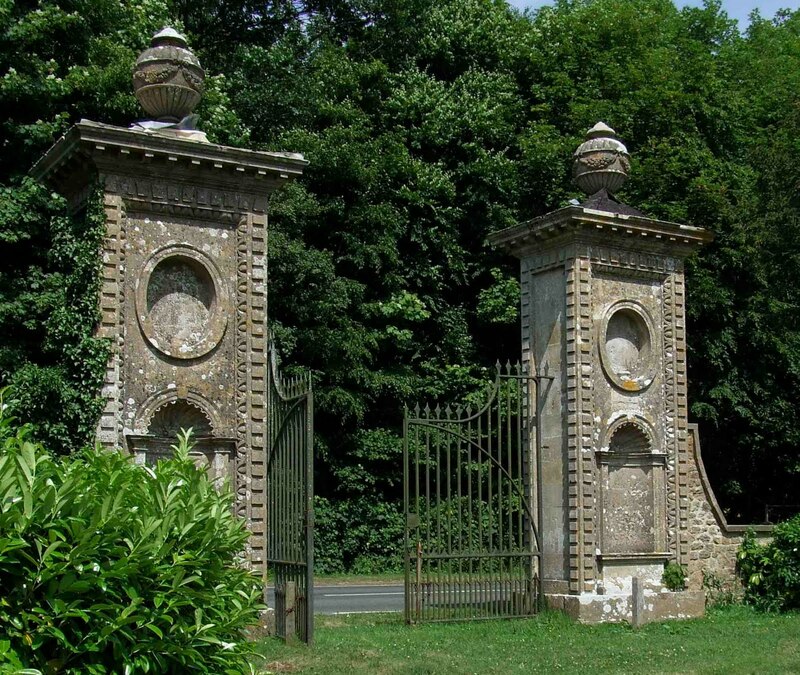 The passer-by would have been interested in the view that the piers were framing, not in the sculptures or the gates, so placing the gateway that way round worked. I’m grateful to this essay for putting me right about the piers’ apparently rather odd placement. It would have made perfect sense when the house was still standing. I’m grateful too for the chance to think again about this evocative place and for discovering how these traces of history tell part of its story.§ It makes me want to pay another visit. *Modern boundaries place Coleshill in Oxfordshire. I allocate it to Berkshire because of a sentimental attachment to the historic English counties and because these old boundaries are used by the invaluable Pevsner Buildings of England series. ¶The book includes a 1922 photograph by Nathaniel Lloyd that shows a pair of busts (of Roman-looking figures) in the niches of the piers. §The estate's later history, including the remains of underground tunnels used by auxiliary units, formed to supply the resistance in the event of an invasion during World War II, are also clearly well worth exploring. 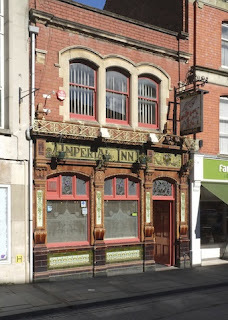 One reader's enthusiasm for my previous post on an Edwardian tiled pub facade made me think how many posts I've done on tiling from this period. Builders and architects in the late-19th and early-20th century used tiles on all kinds of buildings, and did so for a variety of reasons – because tiles are colourful and eye-catching; because they can be used to create ornate decoration relatively cheaply; because their wipe-down surface makes them hygienic; because all these advantages helped to make them fashionable; because this fashion generated a ready supply. Tiles were popular in the interwar period too, but I thought I would post a series of links to a dozen or so previous posts that together give an impression of the colourful variety of Victorian and Edwardian tiles. It strikes me that there are things missing from this list. 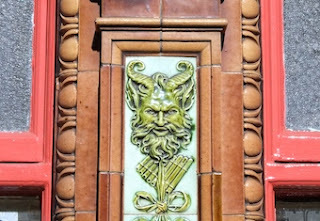 I've not said much on the blog, for example, about terracotta, the widely used unglazed ceramic material that is usually brick-red and was seized upon by Victorian. 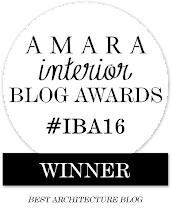 Arts and Crafts, and Edwardian architects to clad buildings decoratively. Terracotta sunflowers, scrolls, leaves, patterns: they are all over the place and I'll be looking out for some to share with you soon. 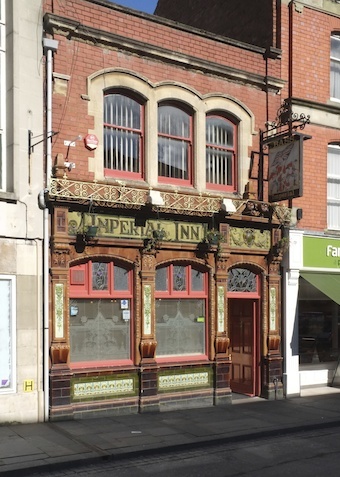 The sun caught the facade of the Imperial Inn in Gloucester’s Northgate Street as I passed the other day, so out came the camera. At last. I’d been meaning to photograph this tiled frontage of 1904 for years, but the building passed often is least often studied closely, and I’d not got round to it. I was surprised to find out that the architects were Knight and Chatters. I’d linked this old Gloucester firm with serious stuff – church restorations, big Gothic vicarages, Cheltenham’s monumental neo-Jacobean Public Library and the same town’s cemetery. 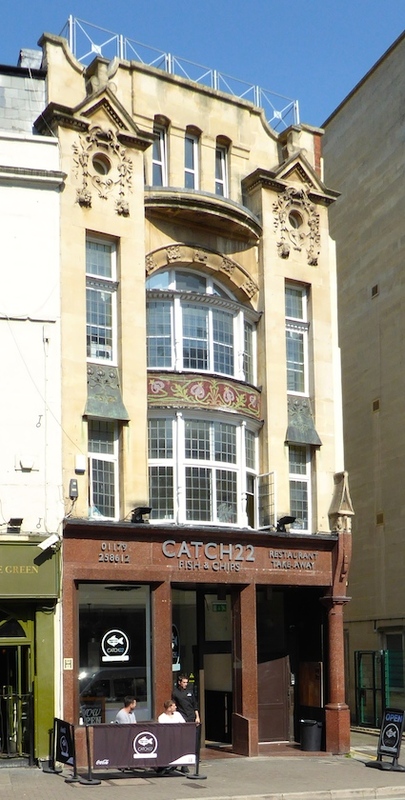 So I’d not have guessed that Knight and Chatters designed this building – pubs were often the work of specialist pub architects, figures whose careers are described in Mark Girouard’s fine book Victorian Pubs. However, the senior partner, W H Knight, is the one I most associate with the libraries, churches and other ‘serious’ work and he died in 1895, so could have had nothing to do with the Imperial Inn. And the design of a pub facade like this has as much to do with the people who produced the glass and the tiles as with the architect. And finally it’s likely in any case that a busy provincial practice like Knight and Chatters could turn their hand to all kinds of architecture, letting their hair down to create lively pub frontages when the demand arose. This small building is a riot of tiling and bright red brickwork. The face of Pan peeps from the tiles running between the main windows, as if hinting at revelry within. Patterns of scrolls twirl their way across the etched glass. 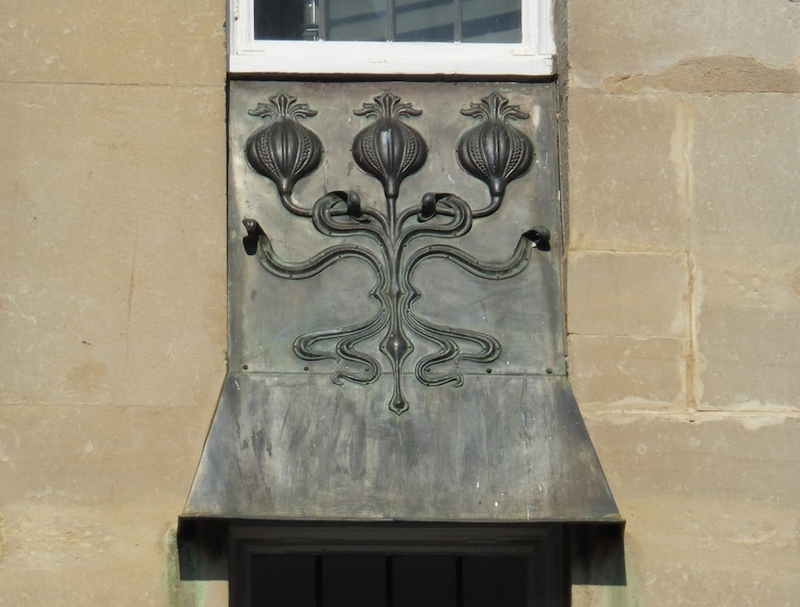 A more restrained and rather art nouveau effect is produced by the stained glass over the door, with its shapes of hearts, its a hints of leaf and bud, and its whiplash curves. Burning gas mantles would no doubt have made this frontage very enticing of an evening in the early years of the 20th century. No doubt the enticement still works, helping to ensure the facade’s fortunate survival. This week I attended a fascinating day of talks by Suzanne Fagence-Cooper on British neo-Romantic art, particularly the work of Eric Ravilious and John Piper. I was struck especially by the way she brought out Piper’s spiritual quality (his stained glass designs were crucial to this) and how she related the artist’s early abstract work to the later paintings and prints, noting how very often shapes and forms that Piper worked out in abstract pictures in the 1930s underpin his later realistic images of landscapes, buildings, and so on. The same is true, I think, of a lot of Piper’s designs for work in other media, from fabrics to ceramics, a theme Suzanne Fagence-Cooper also touched on. I came back thinking (yet again) how much I’d learned from Piper’s pictures of buildings. 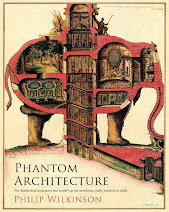 He was fascinated by textures – of stone, plaster, wood, brickwork – and depicted these brilliantly. And his appreciation of texture fed his love of what he called ‘pleasing decay’. ‘Pleasing Decay’ is the title of an article he wrote for the Architectural Review and later reprinted in his lovely book Buildings and Prospects. * Piper wrote other articles that he didn’t reprint, including one on colour and texture in architecture, again published in the Architectural Review.† In it, he describes how one can see the far-gone effects of weathering ‘where derelict and half-derelict buildings become almost one with the flora and geology of the landscape’. Among the illustrations Piper produced for his article was this one of a ruined cottage in Yorkshire.¶ As ever, Piper tells us a lot with economical means. In a scattering of strokes and lines and a few patches of wash, he depicts areas of peeling render, courses of old stones, bits of rubble masonry, and the chunkier quoins that reinforce the door openings and the corners of the porch. Other lines suggest a diagonal crack in the masonry of the chimney and the weathered edges of the slates. The areas of coloured wash suggest that the left-hand end of the house may be an addition, built partly in brick or perhaps a darker stone. The Architectural Review’s wartime printing doesn’t do full justice to the picture – and maybe Piper wasn’t fully satisfied with it, because there seems to be another version with brighter light on the front wall and perhaps more subtle textures in the foreground. But with its occasional shimmering highlights and murky sky, the image as printed is still powerful, showing how, in the least regarded, most disposable of buildings texture can be key to appearance and impact. The quality of a surface – its roughness or smoothness, its materials, its tactile presence – mattered to Piper, and his image makes one think about these small but crucial details. The Resident Wise Woman and I have a habit of parking in Park Street in Bristol and either climbing up the hill to browse in the Oxfam bookshop or going a bit further to find something to eat or drink. One day I wandered down the hill to College Green and, turning my back on the cathedral and library to my right, had a look above some of the shop fronts. This one stood out in particular: a study in turn-of-the-century classicism with a hint of baroque. There’s a mix of traditional details (the little pediments trailing stone carving down the wall) and elements that could only be from this period: above all the windows – the shallow bow; the segmental (curve-topped) window just above it; the tall, narrow openings right at the top; and those tiny round windows (oils de boeuf) below the pediments. All these are features straight from the school of turn-of-the-century English design. But there’s something more. A mosaic frieze of stylized plant forms running in a band across the bow window. 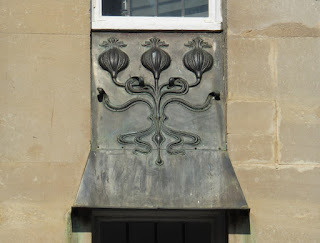 The pale-green stems twist and turn in curves that are more art nouveau, as if whoever designed this frontage wanted a hint of the continent, a breathe of French air, to enliven the building. On either side of this frieze are perhaps the best bits of all, a pair of lead canopies, flaring slightly and adorned with art nouveau pomegranate reliefs. The stems here form those multiple curves doubling back on themselves (‘whiplash curves’, in design-speak) that are so redolent of French and Belgian art nouveau. Such curves are not that common in England, but you find them occasionally on shop fronts that wanted to look highly fashionable between 1890 and 1910. This little gem of a building was built as the Cabot Café. The architects were La Trobe and Weston, but the art nouveau decoration was created by the owner’s daughter, Catherine Hughes. 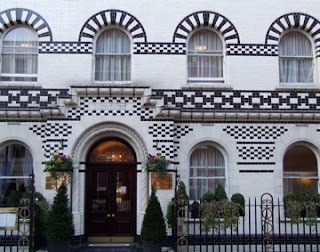 Pevsner sources the mosaic from an 1891 bookbinding design by Charles Ricketts. He further observes that there are traces of the original interior inside, although these certainly weren’t in evidence when I peered through the door. I must return, buy myself fish and chips, and investigate further. In previous posts I’ve noted a full-blown art nouveau shop front in Cambridge and a hint of one in Leamington Spa.